Our S.E. Shires alto trombone case features a streamlined wood shell construction, reinforced lid, dark brown leatherette exterior, and Shires logo medallion. 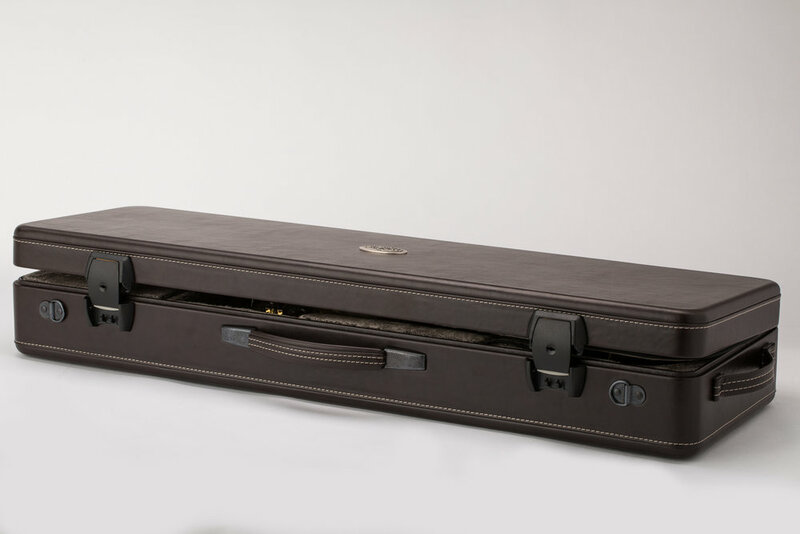 This case stores one alto trombone horizontally offering a supportive and tailored fit, and also features a small accessory compartment with lid for mouthpiece and oil storage. Our S.E. Shires tenor trombone case features a streamlined polyurethane shell construction, reinforced lid, dark brown leatherette exterior, and Shires logo medallion. This case stores one tenor trombone horizontally offering a supportive and tailored fit, two small accessory compartments for mouthpiece and oil storage, and also a large accessory compartment with lid that fits a removable neckpipe or other storage. Our S.E. Shires detachable flare tenor trombone case features a streamlined polyurethane shell construction, reinforced lid, dark brown leatherette exterior, and Shires logo medallion. This case stores one tenor trombone with detachable flare bell horizontally offering a supportive and tailored fit. This case also features one large accessory compartment with lid for mouthpiece and oil storage. Our S.E. Shires bass trombone case features a streamlined polyurethane shell construction, reinforced lid, dark brown leatherette exterior, and Shires logo medallion. This case stores one bass trombone horizontally offering a supportive and tailored fit, with two small accessory compartments for mouthpiece and oil storage. Our S.E. Shires detachable flare bass trombone case features a streamlined wood shell construction, reinforced lid, dark brown leatherette exterior, and Shires logo medallion. This case stores one detachable flare bass trombone horizontally offering a supportive and tailored fit, and two small accessory compartments for mouthpiece and oil storage.